There has been a lot of snowfall and large temperature fluctuations this autumn which has made predicting conditions pretty tricky. 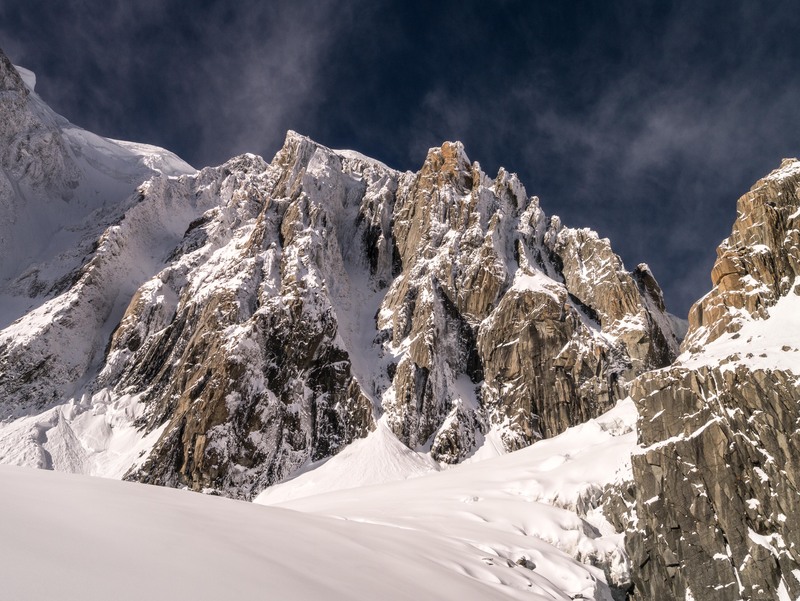 With high expectations and big packs Tom Grant and I headed up the Aiguille du Midi on thursday morning. 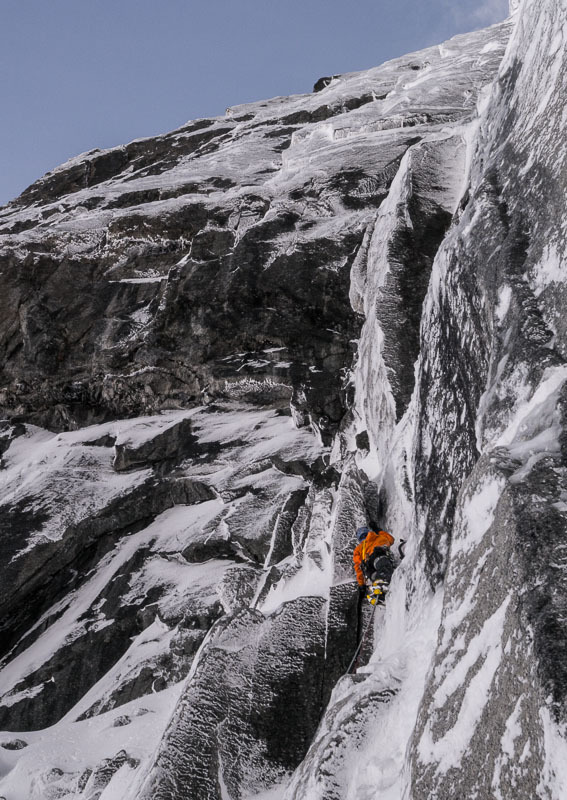 We were hoping for 2 days climbing with an overnight stay at the Abri Simond. 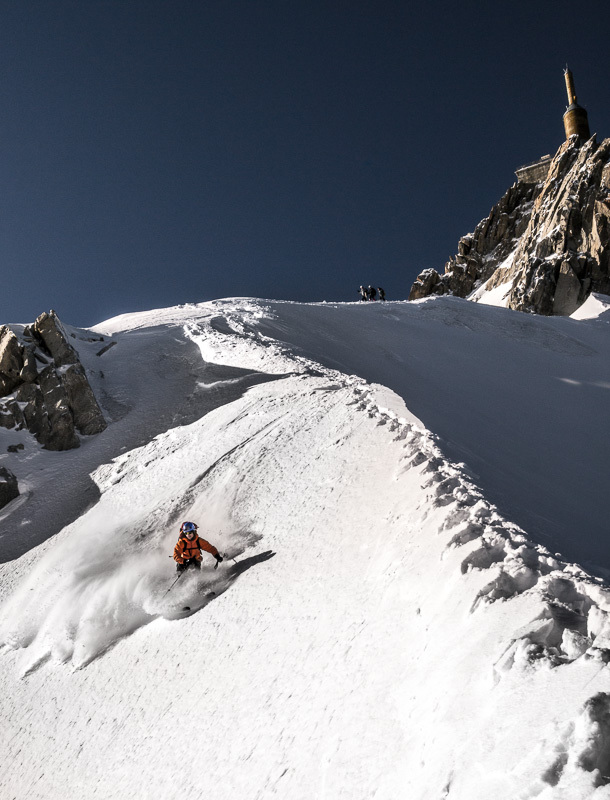 There is now only about one week left until the Midi lift closes for six weeks (last day is 3rd November), so we thought it was a good opportunity to get a high altitude route or two done up there whilst there are still long days and amenable temperatures! 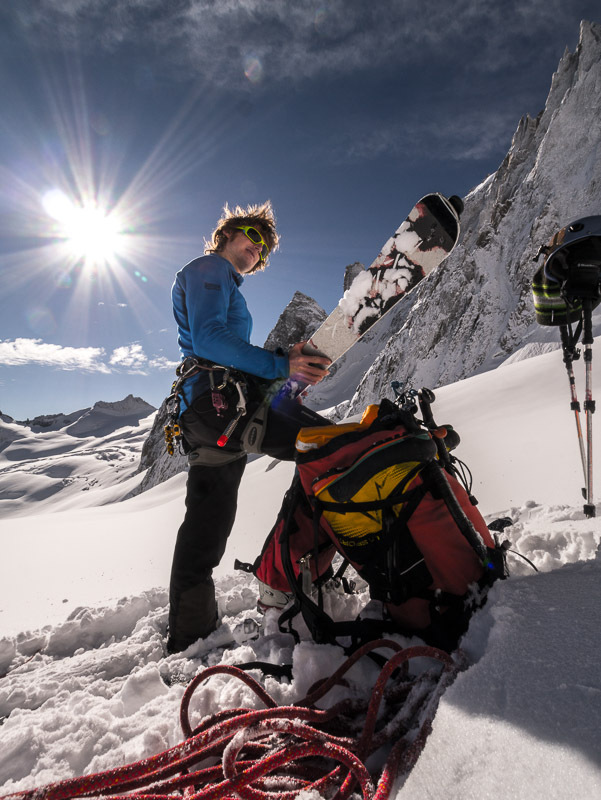 Tom skiing down the Midi arete with a massive pack. Nice 20cm fluffy snow! We took skis to allow us to move around more quickly. As we thought there was quite a bit of snow on the ground. 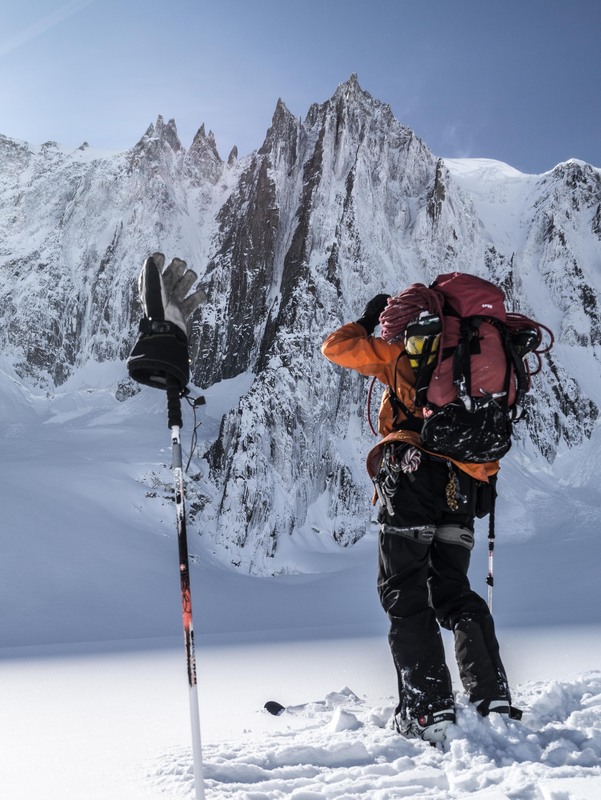 The plan was to get one of the technical routes like Pinocchio done on Thursday and then get up early Friday to do Super Couloir. The Midi lift was inevitably late opening after the storm overnight so we didn’t get on the lift until 9.45. It was a glorious day up high with a carpet of new snow. 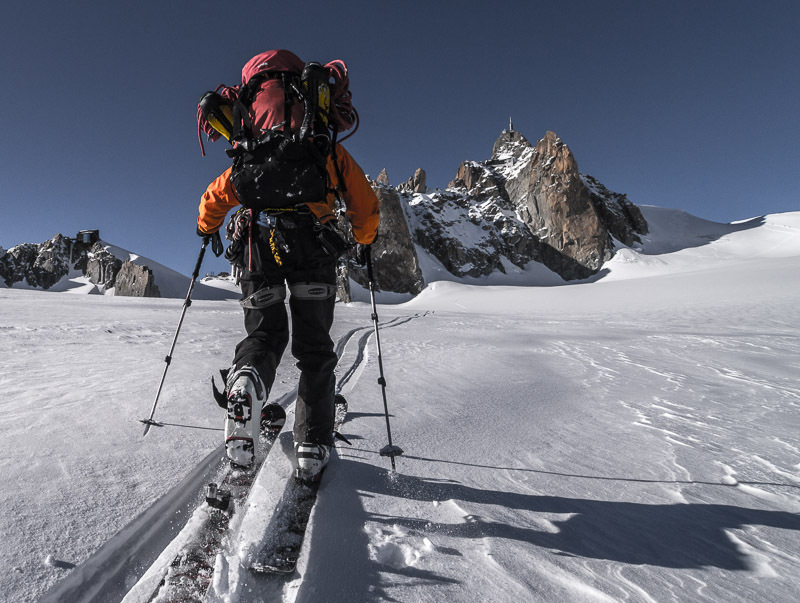 Twenty minutes of creamy turns took us to the base of the east face of the Mont Blanc du Tacul, where we put skins on the skis and made our way up to the base of the routes. Though things looked superficially very white, when we got stuck in we found very little useful ice. I led the snow-slog and mixed step to the base of the routes then Tom tried to get involved first with ‘Slave to the Rhythm’ then with ‘Pinocchio’. Unfortunately we found the lines to be in poor condition. Most of the little ice available was aerated and delaminating. It obscured the axe and gear placements, but didn’t aid progress! Eventually we abseiled back down to the base concluding that whilst it might be possible to tool up one of these routes if you were very strong and persistent, they weren’t going to provide a warm up route for the season as we were hoping for! 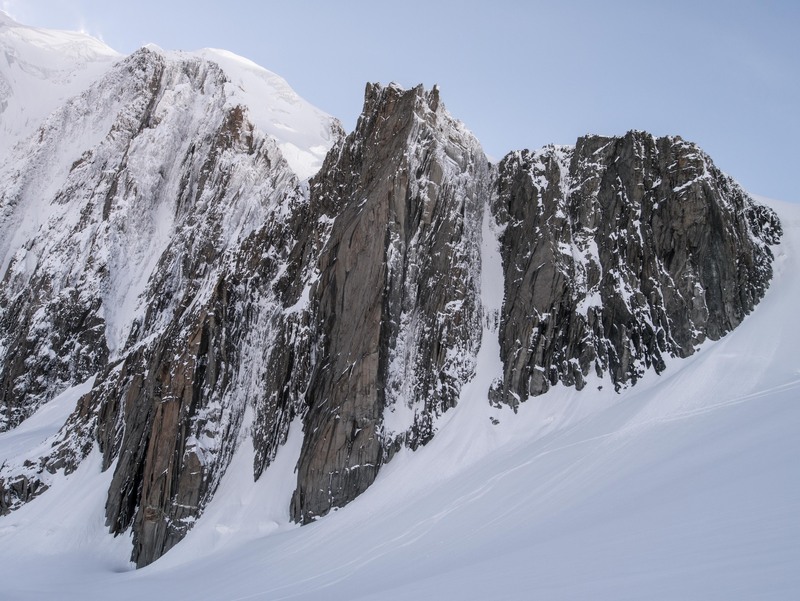 We skied down a bit further to have a look into Super Couloir, but from a distance the direct start also looks to be in pretty tricky condition. By this point it was well after 3 o clock and Tom was pretty keen to go up round to the Triangle du Tacul to do a few pitches there. When we got there, on a cursory inspection these didn’t look too appealing either. We made a very hasty decision to try to catch the last lift down at 4:30pm and possible come back up Friday for something if the forecasted wind didn’t prove problematic. It was 3:50pm and we were at the other side of the Col du Midi from the lift station… what ensued was a lung busting workout to get us and our heavy bags onto the last lift to town! Charging back to catch the lift. Heavy bags plus climbing boots strapped to the outside!